The successful series BLC (backlight compact) has been revised. To meet the demand for a more robust lighting the mechanics were upgraded to a new level. Wessling, 12.06.2012 - The thin BLC backlights offer a wide range of wavelengths. The modular concept allows each aspect ratio in increments of 5 cm to 20 x 20 cm. Flash and continuous light variations offers the right selection according to inspection speed. 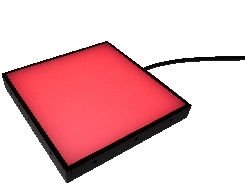 The BLC backlights become now an even more universal solution for cost-effective and powerful backlight applications.